Whilst you won’t win any glamour competitions, your thermal suits are vital for helping you make the most of your time in Saariselkä. Under your suit, make sure to wear LAYERS – we can’t stress this enough! Layers are the best way to help you control your body temperature, rather than just one bulky jumper. That goes for the bottom half as well, thermal base layers under comfortable trousers are essential. Layers of socks also to go underneath the woollen socks provided is the best way to keep your tootsies toasty, and we will finish that off with thermal boots so that you can frolic in the snow as much as you like. Please also wear sensible shoes on arrival as it can be very icy at the airport, and bring some comfortable indoor shoes to wear in your hotel. Gloves with liners are also a sensible option to wear underneath your provided thermal mittens, and a balaclava or buff is a great way to keep the wind chill off your face. Don’t forget a bright cosy lined hat! 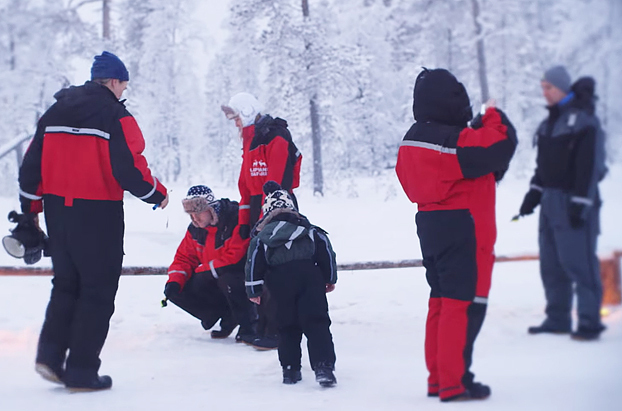 Children do get cold quickly so please ensure you wrap them well in layers, and our Lapland Rangers will keep them busy at the Arctic Circle Centre with songs and games to keep them moving. A family game of snow hockey is great way to keep you all warm!